Chalet, 6 chambres, 6 salles de bains, (Sleeps 21). Vues! Près de Gatlinburg. Smoky Mountain High est perché au-dessus de Gatlinburg avec une vue rapprochée sur le mont LeConte et les montagnes environnantes Smoky. Venez profiter de cette magnifique cabane en rondins avec vos amis et votre famille. Quatre des chambres ont un lit king-size, jacuzzi, salle de bain complète, TV et une vue spectaculaire. La 5ème chambre est adaptée pour nos jeunes visiteurs meublés avec 2 ensembles de lits superposés, salle de bain complète et belle vue. La chambre loft privée dispose de 2 lits jumeaux, un canapé, une télévision et la même vue magnifique! Il ya des lits superposés dans la salle de divertissement inférieure, plus des canapés-lits dans le salon et à l'étage de la télévision. Chaque pièce de la maison offre une vue panoramique fantastique sur le paysage magnifique. Les 3 ponts vous incitent à vous asseoir dehors et à absorber le paysage. Le plan d'étage ouvert vous permet de profiter du temps avec vos amis et toujours avoir votre propre espace. Détendez-vous et profitez du bain à remous, des foyers, de la table de billard, des jeux de société, du hockey sur air, des jeux d'arcade et du baby-foot. Wifi gratuit, internet et la télévision par câble est dans toute la cabine! Smoky Mountain High a une cuisine bien équipée et beaucoup d'espace pour divertir. Smoky Mountain High est à seulement quelques kilomètres de Gatlinburg et à quelques minutes en voiture de Dollywood, de Pigeon Forge Townsend, de Cades Cove et de la forêt nationale de Smoky Mountain. Vous avez un accès facile aux magasins d'usine, restaurants et divertissements. C'est proche de tout mais vous vous sentez si loin dans ce paradis tranquille! Vous pouvez profiter des montagnes, randonnée pédestre, pêche, rafting, routes panoramiques, équitation, pique-nique, natation, nautique, tyrolienne, golf, tennis, parc aquatique, mini-golf, Attractions familiales, artisanat, Shopping, Outlet Malls, Théâtre, Parcs d'attractions, restaurants, festivals, musées et bien plus encore! Nous offrons des tarifs compétitifs. Pour les locations à la semaine, sélectionnez vos dates pour voir le tarif hebdomadaire. N'hésitez pas à nous contacter pour les offres spéciales de dernière minute. The cabin and amenities were great. But the cleanliness was horrible. The cabin size and amenities were great. Plenty of dishes, pot and pans, towels and linen. However, the cleanliness of the unit was a different story. Dust and cob webs throughout cabin, multiple mildew shower curtains, food particles underneath furniture, candy left in drawer, very cold on bottom floor (fireplace in sitting area helped a little but then privacy was loss), one of my guest complained about bits later discovered a dead bug in bed (can't verify how the bug particles got there...), several light bulbs where out when we arrived (cleaning crew came to change some of them-arrived with kids and multiple adults in the vehicle), mice droppings underneath kitchen sink (when cleaning crew came they repositioned items in cabin and left droppings), television on bottom floor cable stop working, vent in main floor bedroom/bathroom was hanging off. The bunkbed cove was interesting. As I stated in the opening sentence the cabin is beautiful. Mountain scene from each deck lovely. All rooms except one had jacuzzi tubs and king beds. Games tables and arcade, fun. The cabins was large enough to sleep 21 which was a booking point me. We had 9 people in the cabin and it never felt crowded. Thank you for taking the time to write a review. We are happy that you liked the cabin and location. Your review left out a few key items. The morning after you arrived, we called and emailed, like we do with all guests, checking to see if you arrived safely and if you had any questions about the cabin or area. You did not respond until the next afternoon telling us that there were cleaning issues, a bulb was out and there were lady bugs. We did not ask you why you were reporting them, we asked why you waited 2 full days before you told us about the cleaning items, lady bugs and light bulbs. We wanted to send a crew in ASAP to take care of any items that needed attention. As we explained to you, our guests’ enjoyment is most important. You didn’t want us to send the crew in until the following day. We also explained to you that in the lady bug season, there isn’t much that can be done to prevent them from entering the cabin, but you did not want to listen to any explanation about being in a cabin or in the mountains. The crew went in at the time you specified to replace the light bulb, change shower liners, re-cleaned the entire cabin and basically do whatever you wanted done. They checked the shower curtains in all the bathrooms (except for one where someone was taking a shower), the curtains were not mildewed- they even took photos to show us. They re-cleaned the entire cabin- dusting, sweeping and mopping. There were no cob webs, but there were crumbs on the floor- but you were already there for 3 days. They replaced 2 bulbs that were out and checked on your list of items. They went back the next day, to check the one shower curtain and to inquire if everything was satisfactory. At that time, you told them to sweep and mop the whole cabin again, which was basically to clean up after your group- which was 14 adults and 6 children (not 9 people). The cleaning crew did sweep and mop again, to ensure you were happy. And of course, the last shower curtain, was not mildewed. You never asked about the heating which would have been an easy question to answer or report any items broken in the cabin aside from a lose bulb in the refrigerator. Although we take every complaint and suggestion seriously, we feel that your comments were incorrect. The fact is that out of 125 reviews on VRBO, 115 are 5 star reviews and 8 are 4 stars. And we are recognized by VRBO as a Premier Partner. That should speak for itself. The pictures tell the story! Other than a few hiccups, perfect family vacation get away. The views are wonderful, the area offers many things to do and see, and the memories are for a lifetime. I would highly recommend this rental for a "Smokey Mountain Get-Away". The cabin was beautiful, it was all inclusive and very welcoming. Beautiful space for family. The property was also very beautiful overall amazing! There were a few difficulties with the refrigerator. The jacuzzi was also very nice. The view was gorgeous and had had many things to do in the cabin! We are glad you enjoyed Smoky Mountain High. The 180 degree unobstructed views are a big hit for the cabin.As we explained when you called, it takes a while for any refrigerator to cool down after the door has been open for a while as you were stocking it with food - and the door should be kept close for a while to let it cool down. The refrigerator works perfectly. Updated cabin with all the amenities in a beautiful location. Three generations of the family had the best Thanksgiving ever. Our stay was wonderful and everything went very smoothly. From the booking process to checkout we had excellent service. The cabin itself is very clean and well appointed. There was nothing we needed other than groceries. Waking up in the morning to the view of the mountains was priceless. There was plenty of room for everybody and the pet friendly aspect was great. As others have noted, the driveway has a steep turn but if you go slow and in particularly if you arrive in the daytime hours which the owners recommend you should not have a problem. We had to arrive at night but it was all fine and once we knew what to do it was not an issue. We would definitely stay here again. Thanks for everything! Hello Cindy, we are thrilled you enjoyed Smoky Mountain High and the area. We try to add all the amenities that our guests will enjoy. Being in the mountains, the roads may be a little steep. Having enough room at the top to turn around, and park makes the driveway easy. And of course the view at the top can't be beat!! We hope you will stay at one of our TN or FL properties again in the future. The cabin was absolutely beautiful. So much more was furnished than we expected. 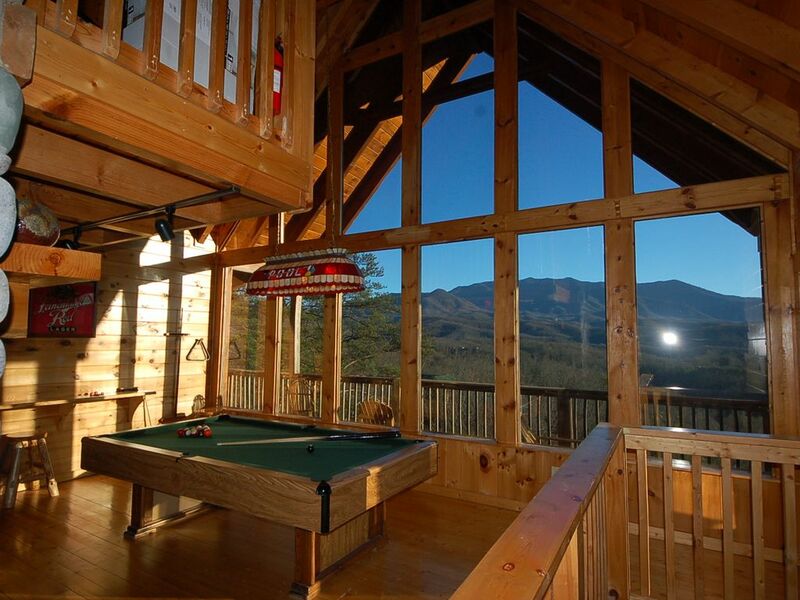 We are so happy that you enjoyed Smoky Mountain High and all the amenities and views it provides! We love the location, being close to everything, yet still have the feeling of being away from it all. And of course the views!! We hope you will stay at one of our Gatlinburg cabins again or perhaps one of our Florida beach homes. For weekly rentals, select your dates to see the weekly rate. Rates are subject to change until reservation is confirmed. You must be 25 or older to rent this property. No parties or groups of more than 21 guests. We allow up to 2 dogs, any size. Pet fee applies. Please check with us if would like to check in on a holiday. Some holidays are not eligible for check in.